1. Preheat the oven to 180°C, gas mark 4. Scrub the sweet potatoes and pat dry with a tea towel. Rub lightly with the olive oil, season and roast on a baking tray for 45 minutes, or until completely tender. 2. Meanwhile, make the salsa. Slice the top and base from the lime. Pare the remaining skin and pith away with a sharp knife to reveal the flesh. Cut the lime flesh out in small segments, setting aside the membrane. Mix the segments with the avocado, cucumber, chilli and sugar; season. Squeeze the juice from the reserved lime membrane into the salsa. 3. Gradually stir the fromage frais (or soured cream) into the wasabi paste. 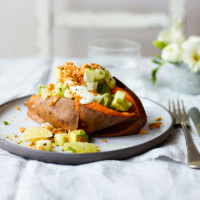 Split the baked sweet potatoes open, spoon in the salsa and wasabi fromage frais and top with the fried onions. This recipe first appeared in the Harvest section of Waitrose Food, March 2017 issue. Download the Waitose Food app for the full issue.